Poppy! I am loving this new camera. Who knew the pollen was purple. A camera stops time. I started these bread seed poppies from seed many years ago. They bloom early in the spring. I keep their numbers small because soon they will end their cycle. See the little rosettes. I grow this on the north side a small rock wall. Note by comparison the sedum growing by it’s side. For about 2 weeks I have seen 3 little robins. There tails were so short, they had trouble flying and mostly walked about my garden. I think something must of happened to their mother, because usually at this stage I would see the mother still feeding them. I have kept watch for them. They finally have longer tails and are flying with more coordination. I know their “cheep, cheep”. My garden is about ready for the Garden Tour on June 26th. The quilters will have quilts on display and each garden will have a local artist with some of their works on display. Should be interesting. I have just a bit of house painting to do (trim) and my daily early morning “weed patrol”. I love to quietly walk about the garden early in the morning when most of the world is sleeping. Sometimes, I so look forward to going to sleep so that I can awaken to my early morning walk. But, come the hot sun and heat of the day and I am in the house! Good thing, since I work from home and work must be done. Enjoy your week. Oh I love your baby robins. It's sweet that you're taking care of them. Love the Saxifrage flowers. I hope the tour is fun and stress free. What a lovely garden you've created! I love the idea of each garden on the garden tour also featuring a local artist, what an interesting way to highlight more local talent. The poppy is stunning, Mother Nature certainly did a fantastic job combining those colors. Good luck with the garden tour Gloria. Hope everything goes well for you. Hi Gloria, I finally checked why I haven't been receiving your posts. I guess they did not transfer over from the old website, so I re-registered. It looks like everything is popping in your garden now after all of that cold weather. It's great you got your garden planted Gloria. 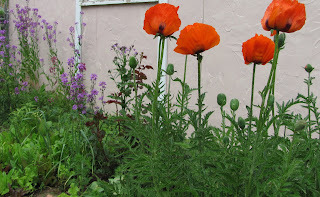 I have the same poppies (Papaver orientale) thaat I grew from seed. I did not know they are also called bread seed poppies. Purple pollen? Who knew!? I admit to still having some butternut squash here from last November. I love how the winter squashes store so well. Your robin is adorable. Last year we had a few Jays that fledged to the ground a little early. I think the nest was so overcrowded they knocked each other out of it. They all seemed to do well though. Hi, Gloria! Good luck with the tour! Your garden looks wonderful!! Your little robins are ready, too. When my garden is about ready for a tour, then the moose and cats will come. Or the hail;) I'm not sure if it's cheating, but I often have a few perennials or a pot on hand to just slip into any untimely open spaces in the bed. Our robins are still at the nesting stage, so no little ones bobbing around yet. Purple pollen is pretty. :) Never saw that before. Good luck with the garden tour, Gloria. I'm sure others will find your garden as enchanting as I do. Your gardens are so very pretty. I love my camera too. It makes taking photos so simple, and the results are amazing sometimes. Gloria I'm so pleased that you have the garden planted and ready for the tour - it must be so exciting. Yesterday with my parents being here just now the rain finally stopted and my mum and I got out into the garden with our cameras and we had great time taking photos of the insides of the poppy - (I've only one flower out just now).They really are exquisite inside aren't they and the little top bit that looks like a spoke of a wheel looks like velvet aswell. Hi Gloria, I updated my blog page to reflect this new blog. I had at one time lost a lot of my pictures. I then went back and tried to add them in but it was a pointless. Most of the time folks don't look at old posts so adding in all those photos just filled up my Picasa and made no sense. I can imagine your garden is always ready for a tour. It is so pretty. I'd like to be one of the visitors in your garden Gloria! You are so right about what a camera can do. I noticed that I spend so much time with my garden pictures - just looking at them, cropping, etc. It's fun, even if I don't use them for my blog.